Happy Easter! Look at this Awesome Giveaway from the GoatieGirls! CONTEST CLOSED. ANOTHER ONE COMING SOON! 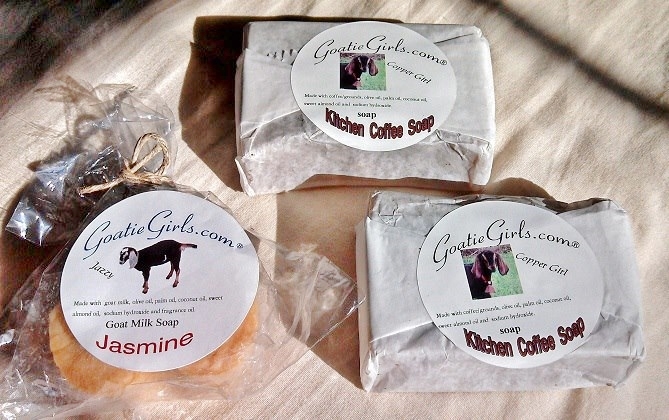 A big thanks to Diana and the GoatieGirls.com for generously donating these gorgeous Homemade Goat Milk Soaps for our Easter Giveaway! We have 3 bars to giveaway so enter often and tell your friends! I would like to win the Jasmine Soap. I am sorry forgot to tell you what I am cooking for Easter. Turkey. A family favorite. Plus the green beans. I would love any of the soaps as they sound fantastic and you can't know which you like best until you try them all right? I will unfortunately not be cooking for Easter as I am going out with the family, so meal time for me will be picking out what foods I can tolerate on the menu of where ever my brother chooses (it's his birthday so I'm not complaining). The Coffee Soaps, but I do not know what I am cooking for Easter!!! I would love to win the Jasmine Goat Milk Soap! Thank you so much for this opportunity! I would love to win the Jasmine soap but any of them will be great! I would love the jasmine soap but any of them would be great!